By attacking Israeli troops and kidnapping one just hours into a new ceasefire Friday morning, Hamas guaranteed that the people it claims to represent in Gaza will face more casualties as Israeli forces hunt for the terrorist who live among them. Yet, for Hamas defenders, this is unlikely to change their descriptions for the group. Despite long-standing terrorist designations by the United States and European Union, to them Hamas is a "sovereign government," a political party, a "humanitarian organization" or a "resistance" movement. A July 14 blog written by Cata Charret on Mondoweiss, a website with a self-described focus on a "progressive Jewish perspective," denounced describing Hamas as a terrorist group as "reductionist and racist," noting they were democratically elected. The Huffington Post's Jonathan Russo called Hamas' terrorist reputation a result of "Israel's mislabeling and misdiagnosis." "When they threw out Fatah in their 2007 coup they became a sovereign government, rulers of a tiny yet definable enclave. At that moment Hamas went from a terrorist group to a legitimate government," Russo wrote. That "legitimate government," we now know, diverted millions of dollars that could have helped build Gaza and improve life for its people into building a vast rocket arsenal and tunnel network with one aim – to kill as many Israelis as possible. Yet Charret and others claim the 1988 Hamas Charter, calling for Israel's destruction and for the killing of the Jews in preparation for Judgment Day, no longer applies because Hamas political bureau chief Khaled Meshaal said in 2006 he could accept a Palestinian state within the 1967 borders. However, subsequent statements by Meshaal and other top Hamas leaders have discredited the 2006 statement as meaningless. "First of all, Palestine – from the (Jordan) River to the (Mediterranean) Sea, from its north to its south – is our right and our homeland. There will be no relinquishing or forsaking even an inch or small part of it," Meshaal said in a December 2012 speech carried on Al-Aqsa TV. "Second, Palestine was, continues to be, and will remain Arab and Islamic. "Palestine belongs to us and to nobody else." Meshaal reiterated his opposition to peaceful coexistence with Israel as a Jewish state in his interview with Charlie Rose that aired on PBS on Monday, saying he did not "want to live with a state of occupiers," namely Israel. He also compared Hamas' fight with Israel with the patriots during the American Revolution who fought against the British. "As a Palestinian, I want to be liberalized, I want a state, I want to live without occupation ... You in America, the American Revolution, was it peaceful? Did you not kick the British out?" Meshaal said. Mousa abu Marzook, deputy head of Hamas' political bureau, also called recognizing Israel a "red line" that could not be crossed in a May interview with Al-Monitor. Scholars, the United Nations, the European Union and the U.S. government generally define terrorism as random violence or other criminal acts, such as kidnappings or hostage takings, against civilians by a non-state actor aimed at instilling fear to achieve political goals. Hamas came to prominence 20 years ago, when it responded to U.S.-led peace efforts between Israelis and Palestinians by launching waves of suicide bombings. Its targets included crowded public buses, restaurants, a teen-oriented nightclub and a mostly elderly crowd at a Passover Seder. Hamas' main political goal remains wiping Israel off the map. The only rationale for launching rockets and mortars at Israel is to instill fear among Israeli civilians, as was its suicide-bombing campaign in the 1990s and 2000s. Human Rights Watch labeled Hamas' rocket attacks against Israel as war crimes in 2010. 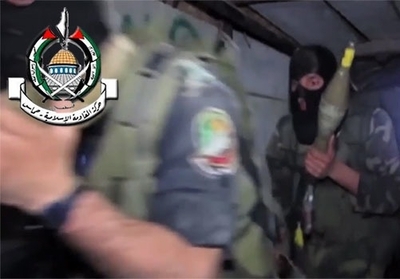 Palestinians living in Gaza have also felt Hamas' wrath since it threw Fatah out in 2007. Hamas has repeatedly endangered civilians by firing rockets in densely populated areas of Gaza, which U.N. officials have labeled as war crimes. The same is true of its use of schools, hospitals and mosques for military operations in the current conflict and in the 2012 and 2009 conflicts with Israel that have similarly endangered innocent civilians. Abductions, murder, torture and death threats against those Hamas accuse of "collaborating" with Israel have been commonplace in Gaza. At least 30 accused collaborators have been killed by Hamas in the past two weeks, according to news reports. These extrajudicial killings have drawn repeated condemnations from HRW. Numerous other due-process violations and unfair trials have been documented by the human-rights group. At least 100 torture allegations were noted in 2012 by Palestinian rights groups. Coerced confessions of collaborating with Israel have also been common. HRW reported that 147 people were tortured by Hamas police or internal security services in 2011. Hamas security forces shot individuals who opposed the terrorist group's rule of Gaza following the 2009 war with Israel, HRW reported. One person it interviewed said Hamas security forces repeatedly shot him in his legs after he openly celebrated Israel's attack. Others had similar stories. HRW also complained about nine documented deaths from torture or severe beatings at the hands of Hamas security forces between January and March 2009. In one case in 2009, witnesses saw Hamas members badly beat a suspected drug dealer with sticks and metal bars, but they were too afraid to try to stop the beating. Amnesty International criticized Hamas in its 2013 annual report for failing to investigate war crimes and crimes against humanity that may have been committed by its members during the 2009 and 2012 conflicts. It also cited Hamas for repressing freedom of speech. Hamas disrupted a rally by women in Gaza last October, the Amnesty report said. In January 2013, Mahmoud Abu Rahma was stabbed by unidentified assailants after he published an article critical of Hamas. The report similarly cited Hamas' military wing for summarily killing seven men suspected of collaborating with Israel. Women under Hamas rule in Gaza face intense discrimination and repression. Hamas banned women from riding on the back seat of motorcycles driven by men and mandated that women wear Islamic dress in 2009. In 2010, Hamas banned men from working in women's hair salons and banned coed schools for students over the age of nine. Hamas created a morality police in Gaza to patrol the beaches to ensure that men and women are dressed "appropriately." Women have been punished for swimming in T-shirts and jeans. Unrelated men and women have been punished for violating the rule against not mingling. Couples walking down the streets of Gaza have been routinely stopped by the morality police who ask if they are married. "You basically have to carry a copy of your marriage license on you at all times, or risk being humiliated," a Gaza couple told the Los Angeles Times. Those who hype Hamas as an elected government tend to ignore that the terrorist group has remained in power beyond its term. It cancelled the 2010 elections. Hamas' popularity has suffered as a result. "We find the Gazans have become so courageous in speaking out because they've just had enough," Fox News contributor Lisa Daftari said Tuesday, after recently speaking with people in Gaza. "They don't want the Hamas terror group really hijacking their cause and not getting them their basic needs." A community organizer she interviewed wanted a ceasefire as soon as possible, and said that Hamas has no interest in peace or negotiations because their children are not getting killed. "Nobody can forgive Hamas for butchering Palestinians to get power. Most Gazans hate Hamas with a passion," Daftari said, quoting a Gaza resident she interviewed. Meshaal's refusal to accept a ceasefire with Israel showed many in Gaza that Hamas does not care about their welfare or their lives, she said. Hamas may have won one vote one time in 2006. Since then, its rule has brought only pain and misery to the people of Gaza. Today's attack, which immediately shattered a planned 72-hour humanitarian ceasefire, is just the latest example of that misery. For people to deny its inherent terrorist mission and try to cast Hamas as a legitimate political movement is delusional.